Profits do not have to be sacrificed to environmental responsibility, or vice versa. Following this book's tested and proven approach, readers discover how to create and operate manufacturing facilities that are highly profitable while meeting or exceeding the environmental standards of their local community, state, and federal governments. The authors' approach is broad in scope, setting forth the roles and responsibilities of organizational functions such as marketing, product design, manufacturing technology, management, and human resources. 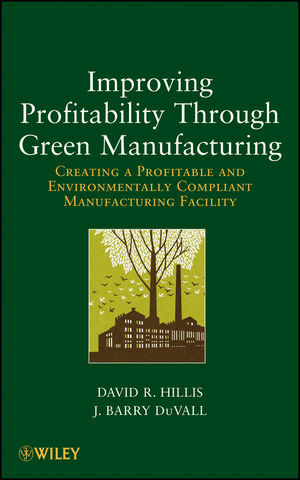 The book begins with an overview explaining why profitability and green manufacturing must be viewed as a single objective. The final chapter is dedicated to a step-by-step approach in the application and use of the profitable and compliant process chart, a core working tool discussed in the book. In this chapter, several actual manufacturing applications, along with their worksheets, are presented to illustrate how this approach can minimize resources and waste. Armed with this comprehensive systems approach, readers will no longer view profitability and green manufacturing as two opposing goals. Instead, they'll have the tools and knowledge needed to create and maintain a manufacturing operation that is both profitable and green. DAVID R. HILLIS, PhD, has more than thirty-five years of experience in academia and private industry. Currently he is an independent consultant who works with manufacturers to maximize productivity and minimize waste. Hillis is coauthor of Manufacturing Processes: Materials, Productivity, and Lean Strategies; Manufacturing Processes: Automation, Materials, and Packaging; and Waste Reduction Strategies for Fiberglass Fabricators. J. BARRY DuVALL, PhD, has more than forty years of experience in industry and academia. He is currently a full Professor in the Department of Technology Systems at East Carolina University. He has taught courses in many areas including productivity improvement, manufacturing processes and materials, digital communication, and technology management. Dr. DuVall is the author or coauthor of Contemporary Manufacturing Processes; Manufacturing Processes: Materials, Productivity, and Lean Strategies; Manufacturing Processes: Automation, Materials, and Packaging; and Getting the Message: the Technology of Communications.